My mission is: education, research, entrepreneurship. We have made it again with the Alquist bot. Alquist competed with the Alana bot from the Heriot-Watt University, Edinburgh, Scotland and the winning Gunrock bot from the University of California Davis Davis, CA, USA. A $500,000 prize was awarded to the winning team. We are bringing back $100,000 in prize money, and Alana receives $50,000, The challenge for additional, a $1 million research grant has not been awarded yet. It will take some time to make 20 minutes long chat. Just imagine how difficult it will be to get to a bar and talk to a stranger for 20 min. 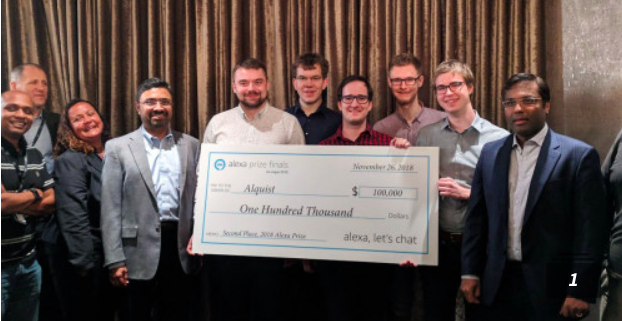 The Alexa Prize is a $3.5 million challenge for university teams to advance human-computer interaction. Similarly, as last year the goal was to develop the best social bot conversing coherently and engagingly with humans on a range of current events and favorite topics such as entertainment, sports, politics, technology, and fashion. We continued this year with the Alquist II starting from the beginning of 2018 when the Amazon Alexa Prize was announced. We submitted our proposal, and we have made it in between eight semifinalists who were selected from more than a hundred teams from 15 countries. Amazon has awarded us with a $250,000 research grant, Alexa-enabled devices, and free Amazon Web Services (AWS) to support our development efforts. The research grant was significant support for our team The team leader as last year was Jan Pichl who is pursuing the third year of his Ph.D. program at the faculty of Electrical Engineering in Conversational AI. This year charged with enthusiasm the team decided to drop the first version of Alquist and started from scratch with an entirely superior, new design. We built on the latest neural network technology in combination with a small number of rules to conduct the dialogs. Alquist II knows how to react to most conversational utterances, but it excels in 26 selected topics. A great deal in the quality improvement came from a large number of users conversing with our bot. Each conversation helps to understand better the complexity and select the best matching reply. In-depth knowledge is required to create an exciting and entertaining conversation. Where to get the content? The web is an endless source of interesting facts, but mostly in a written text. When played back it feels too long and a little tedious. To make the conversation natural, we had to solve this problem. The large part of work went to the knowledge acquisition and processing. If you are a lucky owner of Alexa device, you can test the Alquist abilities, just say let’s chat with Alquist. The Alexa Price winners announcement was part of the AWS re:invent conference in Las Vegas. The finalists were invited. We all have enjoyed a grand celebration as well as the gathering. Amazon is investing a lot in the development of intelligent conversational gadgets led by Alexa. The experts predict that the most natural way for communication, the speech will become in the nearest future an additional channel to control appliances, access knowledge, etc. It is fascinating and inspiring to find our team between the leading groups in the world working on the latest technology with an exciting vision. We wish our success will attract new students to join our team an pursue our adventure next year. Let us know! Services as following article to find best suitable for the same. movers and packers in Dubai, villa and furniture movers items. Welcome to Doha Escorts agency, we are the top charted agency for gentlemen exclusive hilarity services to provide industry top ranking Escorts In Doha. The Golden Globes are a couple of brief weeks away, however the assignments list is as of now out — which implies you can begin rounding out your Golden Globes 2019 vote like, at the present time. Golden Globes Award 2019 live stream.